This is a Canadian soldier's WW1 ID tag from later in the war. The early aluminum tags were phased out as aluminum was expensive, and these pressed material tags issued. This tag is stamped with the name A. L. Bowers and Regimental Number 2498308. The next line has a "P" presumably for rank, and the bottom has the soldier's unit. In this case it is 4C.M.R. which stands for 4th Canadian Mounted Rifles. We also have two of Pte Bowers' medals stamped with his name and Regimental Number on the side. Who was A.L. Bowers? Did he survive the war? 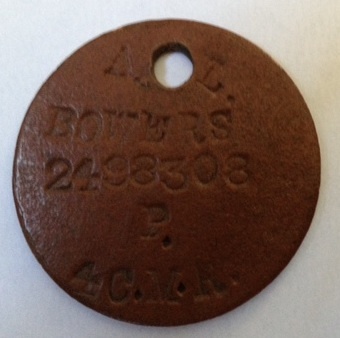 My hunt began with the online CEF database where using the Regimental Number on the ID tag I found the Attestation Papers of Arthur Leslie Bowers born 13 April 1894. Arthur was living in Oshawa but was born in Engfield England. He gave his father, also living in Oshawa as his next-of-kin but failed to provide his father's name. He is a horse driver and a single man. 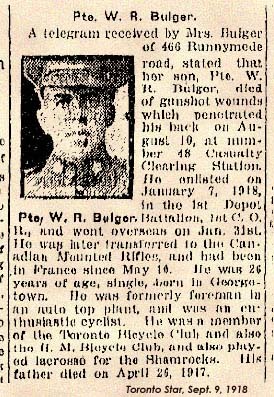 His attestation took place in August 1917 in Toronto. I wanted to know more about Arthur so using Ancestry.com I searched census and marriage records. There was nothing conclusive in the census records for 1911 or 1901 but marriage records showed Arthur marrying in October 1924. Arthur was listed as Arthur Leslie Bowers living in Oshawa born England age 30 son of Arthur John Bowers and Kate Anne Brant. His bride was Elizabeth Daisy Dunk born England age 30. Her parents were George Dunk and Mary Emily Wilcox. Once I found the marriage record I was able to locate the family in the 1911 census for Athol Township, Ontario. The father Arthur Bowers, a baker, was shown as immigrating from England in 1910. His date of birth was June 1865 in England. His wife Kate was born March 1866 in England. Their children were listed as Leslie (this is Arthur Leslie) age 17, Slanty [?] a son age 10, Sidney age 7 and May age 2. I next found the family sailing from Bristol England to Quebec on the Royal George on 2 June 1910. They are going to Picton Ontario. The passenger list revealed the name of their second son - Stanley. My curiousity and genealogy obsessed mind wanted to know more. I looked for the family in the 1901 England census and found them living in Enfield, Middlesex England. Kate was listed as born Dalston, London England and Arthur gave his birth place as Carshalton, Surrey, England. Little 6 year old Leslie was born in Enfield, Middlesex, England, as was his 9 month old brother Stanley. I was unable to find death records for Arthur Leslie Bowers. Steve asked Olive Tree Genealogy a very good question about making assumptions from details on a census. How can one determine the relationship of individuals on the 1860 census. On the 1860 hardy county va census, my great grandfather Thomas Wilson is placed below a Pamelia Wilson, and above that a Judy Wilson. Can I safely assume that Thomas is Pamelia's son born out of wedlock? Steve - This is an important question in genealogy. The short answer is "Absolutely not!" You should never assume anything in genealogy research. You can however create what I call a Working Theory, based on the facts you have found. In the example you gave, you don't know how Thomas is related, or even if he's related at all. Let's look at some possible scenarios (with the caveat that you have not told me the ages of the individuals and that's an important consideration when developing theories). 1. Thomas might be Pamelia's son. 2. Thomas might be Pamelia's nephew. 3. Thomas might be Pamelia's cousin. There are other possibilities depending on the ages of Thomas and the other individuals in the census. You think that Thomas might be Pamelia's son. That's a good working theory. Your next step would be to search for records that PROVE or DISPROVE your theory. * Can you find Thomas or Pamelia in 1850 or 1870 census? Continue researching Pamelia. Find out what you can about her. Is her father named Thomas? That might add a little more weight to your working theory (although that still would not be proof of a mother-son relationship). Perhaps Pamelia has an obit that mentions a son Thomas. The bottom line is that unless you find proof, it's only guesswork. And genealogy is about facts and truth, not guesses. Guesses based on a record you found are important to aid you in developing a working theory but you still must prove (or disprove) that theory. Don't miss Season 3 of Who Do You Think You Are? 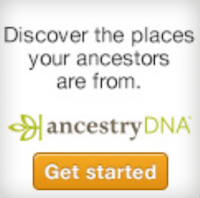 sponsored by Ancestry.com take you all over the world and inside the fascinating family histories of 12 celebrities. Tonight - Actor Rob Lowe ventures into his past and discovers an ancestor who battled against George Washington during the American Revolution. It's been two weeks since the last episode from Season 3 and I'm really looking forward to tonight's. I'm guessing Rob found out he had Loyalist ancestors (as I do). I'm only praying the producers don't make the mistake that grates on every Loyalist descendant - and that is calling them Tories instead of Loyalists. Fingers crossed! Pte. W. R. Bulger's name is stamped on the side of this Canadian WW1 Medal which my husband and I have in our WW1 collection. In tribute to Private Bulger and all the men and women who have served and continue to serve in defense of our countries, I will be posting images and research on the various soldiers whose identified items are in our collection. Pte. Bulger's Regimental Number is difficult to read but it ends in 2369. He is noted as being assigned to 2-CMR which stands for 2nd Canadian Mounted Rifles. A search for his Attestation papers online reveals that his full name was William Robert Bulger and his Reg. Number was 3032369. He was born Sept. 28, 1888 in Georgetown Ontario but was living in Toronto when he enlisted. His next-of-kin was his mother, Mrs. Margaret Bulger in Toronto. He gave his occupation as Attic Trimmer. The year he enlisted is not given but it was probably either 1917 or 1918. Sadly William never made it home from the war. He was killed August 11, 1918 and is buried 3/4 Mile South of Amiens, France in the Hospital Military Cemetery. The CEF Burial Register states that "while en route to his Battalion he was wounded by a bomb dropped from an enemy airplane. He was evacuated to #48 Casualty Clearing Station where he succumbed to his wounds" It was further noted that he had penetrating schrapnel wounds in his back. Thanks to Lisa Haas we can also read a newspaper clipping about William's death. Lisa's great-grandfather's brother was married to William Bulger's sister and Lisa had this clipping in her research files. Well, these 8 filing cabinet drawers in my current office are empty. And the files they contained have been sorted and purged. You can see a few of the boxes of files ready to be moved to their new home. Those that I need on a daily or weekly basis are going to my new office in the loft. Those that I use a few times a year will go to our basement family room and the ones that I need to keep but probably never look at again are going to our basement storage room. I still have to empty 2 more lateral filing cabinet drawers (6 linear feet) and 2 letter size filing cabinets. Then I'm ready to tackle the bookcases! Phew. My son will be here on Friday to help move the furniture so I have to have everything ready by then. Hubs moved some of the packed file boxes to the basement for storage and he's going to move the rest into our dining room temporarily. I can hardly move in my office at this point! On the right you can see the huge box of papers I'm burning. Hubs already burned one box this size. The box is as tall as my desk. It's been exhausting and tedious but what a great feeling to purge! I had no idea I'd enjoy it so much. There's much more to do but we've passed the half-way point now! Recently I met Nick when he emailed me about a man named Henry Taylor. Henry was a British soldier who was hidden from the German army in Italy by Nick's grandparents. Nick wanted to find Henry's family so that his aunt could reunite with them. During our many email and Skype conversations Nick found out that I collect, among other things, antique tins. Much to my surprise and delight Nick sent a gift - a tin he found in the bush up north many years ago. Nick told me he was working near the Albany River when he found this tin pictured on the left. The Albay River flows northeast from Lake St. Joseph in Northwestern Ontario and empties into James Bay. So it's pretty far north. 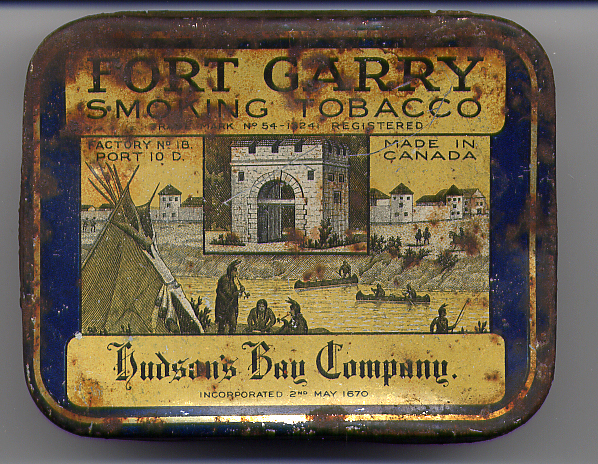 The tin may look in rough shape to a non-collector but it's actually a very nice tin made circa 1910. 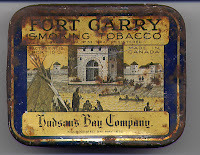 It's not easy to find tins with Hudson's Bay Company wording. So for me it's a gem! And having been sent it as a kind gesture from a new friend makes the tin even more special in my eyes. I think it's so great that Nick kept the tin all these years in hopes that one day he'd meet someone who would cherish it and give it a home. Once the tin arrived from Nick's home in British Columbia, my husband cleaned it up a bit to get rid of some of the rust. You have to be careful doing that as you don't want to damage the surface or the graphics. Some of you will be wondering what kind of tins a person can collect. Well I collect themes as well as miscellaneous tins that appeal to me for their graphics or colours. I enjoy thinking about the people who might have owned them. 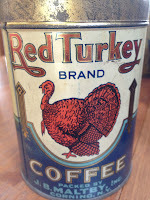 One of my collections is antique coffee tins. Here is one of my favourites on the left. I also collect antique medicine tins and vintage marshmallow tins. Someone once asked me how many tins I have displayed in our home. Well I just counted and I have 29 coffee tins displayed in the kitchen, 21 medicine tins in the bathrooms, 7 marshmallow tins in the family room, 5 WW1 tins, 5 starch tins and 5 tea tins also in the family room. Really, not many, less than 75. Nick's tin is a very welcome addition - thank you Nick! Not just another great tin to add to my collection but a new friend. And as an added bonus Nick's wife sent a jar of her homemade Saskatoon Jelly - yummy! How lucky can one person get! I am very touched by these stories I have read about these MIA bracelets. I too am trying to find any family belonging to the soldier of the MIA bracelet that I have. His name is Gordon C Hall. I went to the Vietnam Wall last week and penciled a sketch of his name and left a letter thanking him for his service. (my father was in Vietnam). My mother has kept this bracelet all these years and I wanted to leave it at the wall, but we decided to hopefully find his family. The sale will begin at 6PM Thursday April 19th and will conclude at 11:59PM on Saturday April 21st. There will be no need for a coupon - all prices will be automatically adjusted on the website. (Arlington, VA)–The National Genealogical Society's thirty-fourth annual Family History Conference, The Ohio River: Gateway to the Western Frontier, will be held 9–12 May 2012 in Cincinnati, Ohio. A highlight of the NGS 2012 Family History Conference will be the Genealogy Youth Kamp on Saturday, 12 May 2012, at the Duke Energy Convention Center from 8:30 a.m. until 12:00 p.m. The Kamp, designed to develop an understanding of family history, is intended for youth 8 to 16 years old. Scouts and 4-H groups are encouraged to participate in the event with their leaders. The morning will be composed of a variety of hands-on activities including a workshop focusing on genealogical merit badges. A special program is planned for interested parents, grandparents, and adults who are welcome to attend. Here's another way I got to use my Flip-Pal Mobile Scanner with Auntie. 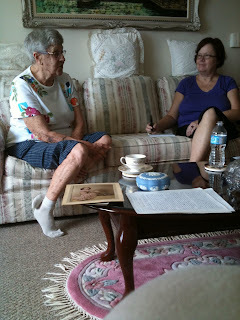 We usually chat and drink tea while I scan her box of photos. 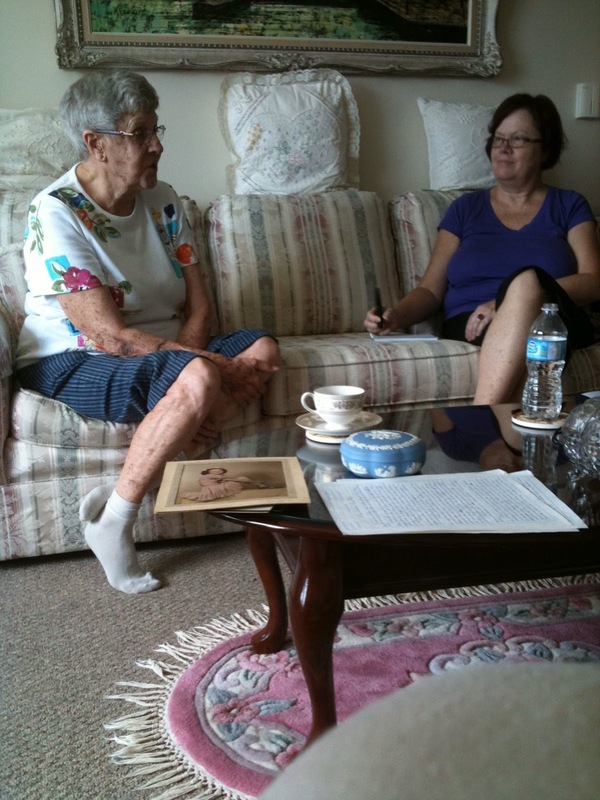 This time I recorded some of her memories using my LiveScribe Pen and then I used my Flip-Pal Mobile Scanner to scan the start of her life story she'd written out on loose pages. You can see the pages she'd written sitting on the coffee table waiting to be scanned. The stitching software with Flip-Pal allowed me to easily scan the pages in sections then stitch them together seamlessly when I got home. All I did was transfer the scanned sections to my computer and let the stitching software do the work putting them together in one seamless page after the other. I also bought a small journal for Auntie to write down more life stories as she thinks of them. I'm looking forward to visiting again to see what else she's remembered. 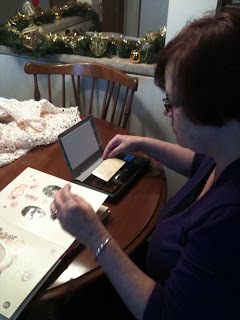 I'll take my Flip-Pal Mobile Scanner with me of course to scan any memories she has done. If you don't have one of these amazing scanners yet there's a good deal right now that might interest you. Stage 1 of the genealogy re-organization in preparation for the move shows some of the tubs and boxes I'm using for the sorted files. These are some of the files that are going up to the loft once the filing cabinets are moved. My method is to go through every filing cabinet drawer in my current office space. I'm sorting and tossing - a huge purge of papers! Basement storage is where I put items that I don't need to access in the foreseeable future but don't want to throw out. It also includes paperwork relating to my business which I must keep for 7 years. The image on the right are cardboard file boxes that I had to purchase in order to pack up some items. The bottom two are going to the basement for storage even though one is research for a book I hope to write one day. The key words are "one day". I will store the research material out of my main office until I am ready to start compiling it. The box labelled PEER BOOK is going to the loft but once there it will be sorted. The first volume of my planned series on the Peer family of N. America has been published so I'll remove the research material I used for that book. Volume 1 research materials will be given room in the basement storage area but the rest will stay in my new office so I can access it. One is current and important papers and documents (genealogy, business, personal) that stay in my new office and I can access easily. These are things such as research for a current book I am working on, client work, and so on. These will go in my new office space. Two is papers and records I might need in the next few months or year. These will include research on books I have planned to write but are in the queue waiting their turn. These will go in the basement filing cabinets. Three is papers and documents that I may never need again but I can't bear to throw them out! This also includes the 7 years worth of business receipts and records that I'm required to keep by law. These will be boxed, labelled and put into the basement storage room. I'm almost finished all the filing cabinet drawers. I just have 1 1/2 lateral filing drawers to sort and 2 smaller legal size drawers in another cabinet. Once I'm finished those drawers I'm moving on the piles and piles of loose papers on my desk, on my credenza, on the floor and stacked in tubs. Oh boy. I've got a plan in mind as to how I'm going to sort and re-organize those loose papers and will talk about that in my next blog post. Above you can see the huge box I'm filling with papers for hubs to burn. This is my second - he already burned one full box! The Flip-Pal Mobile Scanner Spring Daily Deals! You all know how much I love my Flip-Pal. Well here's your chance to get a deal. For 6 days Flip-Pal offered a Daily Deal. Today's the last day! We know that Edgar J. Hooper is the young man on the right and my husband thought he remembered his Aunt Florence telling him that the other two boys were Edgar's brothers. The only clue, other than clothing and hairstyles, to help date the photo is the photographer's logo which isn't visible in this image on the left. It is in the bottom left corner and reads "Webster & Co. St. Mary's"
The first thing I needed to do was find out when Edgar was born. So I turned to Ancestry.com . I knew Edgar's father was John Hooper and figured Edgar was born circa early 1880s since his son Wilbert (Aunt Florence's husband) was born circa 1913. The first document I found was the 1901 census for Blanshard Township, Perth County Ontario. There was 16 year old Edgar with his parents John and Kezia Hooper. Edgar's siblings were listed as Luther age 14, Edith 11, Milton 11, Eva 6 and Ella 3. Next I looked for information on when Webster & Co. was in business in St. Mary's. That was a bit challenging as I don't have a book on early Ontario photographers but it seems they were in business starting circa 1907. We do not know for sure but it seems quite possible that this photograph is Edgar, Luther and Milton Hooper probably taken circa 1907-1910. If this is Milton I also found that in 1915 he was in Huron County Ontario where he married Josie Bell Elsley. I did check the 1891 census to see if Edgar had an older brother but he is found as a 6 year old and the oldest in the family with siblings Luther and Edith. 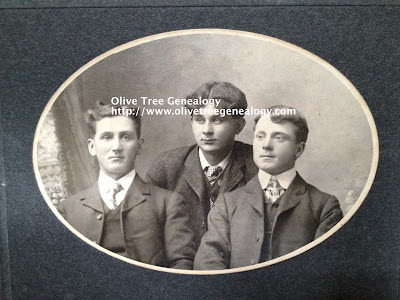 If anyone knows for sure who the two young men are with Edgar or has a better timeframe for Webster & Co. photographers please do let me know in the Comments section of this blog post. Here's a preview of the other daily deals that you'll find here on Olive Tree Genealogy blog tomorrow. It's the last day for the Daily Deals. 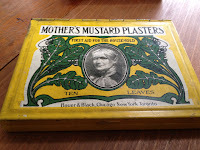 When my husband's Aunt Florence died, no one wanted a dilapidated cardboard box full of photos. The box was stored in a damp basement and was musty and dirty. Many of the photos inside were damaged and water stained. But my husband rescued the photos and brought them home. He threw the box out and went through the photos, noting on the back who the people were that his Aunt had identified when he was younger. Then he tucked the photos away and there they lay for a few years. Until last weekend. He pulled them out of storage and we went through them again. There are some lovely photos and I can't bear to see them just sit in storage in our home so I'm going to share them here on my blog and then scan them to publish on my Lost Faces website. I hope descendants will find them! There are 50 assorted photos, postcards and letters. One letter is from a WW1 soldier and is dated 1916 and written on birch bark. We know that all the photographs have some connection to the Hooper and Squires families of St. Mary's Ontario Canada. That's a small town in southwestern Ontario where most of my husband's ancestors (maternal and paternal) settled in the early 1800s. In fact he's related to most of the townspeople! Aunt Florence was an Elgie and she married Wilbert George aka Wib Hooper. Wib was born in Granton, just outside of St. Mary's in 1913 to Edgar John Hooper and Ettie Squires. Wib's birth wasn't registered at the time, but in July 1947 his mother filed affidavits to testify that was his birthdate and that she was his mother. The nice thing about a late birth registration is that more detail than normal is given. For example Wib's late birth registration found on Ancestry.com gave me the information that his mother was born in Tuckersmith, Huron Co. Ontario and his father in Blanshard Twp, Perth Co. Ontario. The Hooper family is/was well known in St. Mary's. They ran a dairy (Hooper's Dairy) for many years. So my husband knew quite a bit about the family history already. We noted several photos of Edgar J. Hooper ranging from him as a young man to a much older man. There are family photos of Edgar with his mother and father and siblings so we know we can search census and birth records to find out names of everyone in those photos. Hubs knew that Edgar's father was John Hooper and that Edgar and Ettie had two boys - Wilbert (Wib) and Earl. He can't recall John Hooper's wife's name but we know that marriage records will provide that detail. There are also a few photos of Edgar's wife Ettie Squires. There are also photos of Ettie with other young women who appear to be her sisters. There's quite a family resemblance and most of the girls wear glasses. So my days of fun are about to begin as I research the Hooper-Squires family in St. Mary's and Granton Ontario using Ancestry.com . I'll start by putting up the photos that we can positively identify and also any research I do on the people in them. It's going to be a lot of fun (and work!) because we also plan to run some facial recognition software to help us match uncertain photos with known. Once we have all the photos organized, inventoried, scanned and published online, we will probably donate them to the St. Mary's Museum. We will also consider requests from any interested descendants. Yesterday I wrote about starting a big genealogy re-organization. Well I'm happy to report some progress was made! After four hours I got one drawer in one lateral filing cabinet sorted, reorganized and emptied for the move. The filing cabinet drawer you see on the left was full. The filing folders you see in the tub are what I pared it down to. The binder is just to hold the files upright. I have 5 more of those drawers to go plus two more the same size in my credenza. That's not counting my other filing cabinet in the room. I don't want to do the math to get a total number of hours needed just for the filing cabinets. Of course I need to figure out where the files being moved are going until the loft is cleared out. Oh boy that's another little problem of logistics! I also managed to clear part of one bookcase and sort the books into three categories. I might take this opportunity to inventory the books too. I have a pretty big stack of papers for burning and some have been shredded. It's fun to find things that have been mis-filed or that I forgot I had! I found a short story I wrote about 12 years ago and had no idea where it had gone. I want to create some simple drawings to go with the short story and turn it into a 15 - 20 page children's book. Then I'll publish it through Shutterfly and give a copy to each of my grandchildren. Do you think I have time? Hubs has already cautioned me not to get side-tracked. Save $20 on the purchase of a Flip-Pal Mobile Scanner with Creative Suite Craft Edition DVD! Today's the start of an exciting project. Because my husband received so much antique furniture, china and collectibles from his grandmother Kak's home, we need more room. We already have a house full of furniture and our own antique collections. An addition is out of the question so I'm giving up my 16x20 office. I'm downsizing from that big room that I've used for the past 15 years to our much smaller 12x15 loft room. That's not a sad decision, it's an opportunity to make big changes and purge and organize my paper files! That's always been a hard thing for me to do. I'm a paper saver. Yes. I love paper files. I've digitized about 50%, but I always want my paper backups. But not only is the loft smaller, it has slanted ceilings and only 3 walls. Because one wall is railing where the loft overlooks our cathedral living room. So I don't have room for the tall credenza and two tall bookcases that I currently use. Because the loft is chopped up with a dormer at one end and a small powder room at the other, I don't have a lot of wall space. And there is only one full height wall. So no room for my two lateral 3' long filing cabinets, and my rolling antique dentist unit that I use for office materials, or my pine harvest table that currently holds my hanging files or.... well you get the picture! I am going to have to weed down to 3/4 of my current desk (hubs has to figure out how to make an l-shaped desk out of a u-shaped one), my credenza and one lateral filing cabinet. Oh yeah and one bookcase. So all my files have to fit into the credenza or one filing cabinet. A challenge to be sure! I am going to have to purge like crazy. The one bonus is that I can put my second lateral filing cabinet in the basement for overflow. Phew. Today's the day I begin sorting and organizing and purging. I'm anxious about it but a big part of me is looking forward to it. It's spring. It's a new beginning. And the pot of gold at the end is an entertainment/family room full of Kak's bequests mixed in with our own furniture that we've been cramming into whatever space we could find elsewhere in the house. I've got a bit of an idea for a working system to start the process. I figure I'll sort first into business vs genealogy vs personal. Three basic "piles". Business vs personal is easy - anything older than 7 years gets shredded. The rest gets organized into categories, labelled if needed and only the current year stays in my files. Older years go into a large envelope, labelled by year and taken to basement storage. This will be a flexible system, and I'll change it as needed. That means I finally have to steel myself to toss the photocopies of French documents I used to write my first Van Slyke history book. That's a pile of papers at least 3 feet high. Maybe higher. That means I have to throw out the copies I've keep of documents about various family lines that aren't mine. You know, the ones you keep "in case". In case some other genealogist ever asks you about that family. In case you one day find out you are related. I'm taking the plunge, after 25 years with me I don't think I need them taking up space in my home anymore. That's going to be tough to do. But perhaps I'll finally be able to proudly proclaim that I have indeed organized my genealogy! 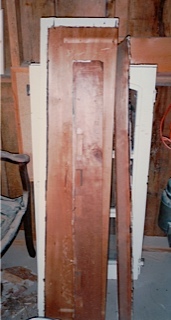 One of the antique items that my husband's grandmother, Kak, left him was the antique hutch on the left. This hutch sat in her big farmhouse kitchen for the past 20 years. Kak always kept her fancy china and dishes in the top. The bottom was full of her favourite candies (Hershey Kisses and Hugs) and other snack food. Her stereo was in there too and every morning at 5 a.m when she got up, the stereo went on. But the hutch has a convoluted family history! It was locally made in or near the small town of St. Mary's but we are not sure of its age. It appears to be a unique piece of work, not factory produced. The hutch was in the Mercer home for many years until it was purchased by one of two sisters Lena Tovell and Elsie Hyde sometime after 1930. The sisters moved in together after their husbands died. The hutch ended up in their back kitchen. In the 1980s Kak ended up working for the elderly sisters as a housekeeper. Since it was a small town they knew Kak was connected to the Mercer family and they told her the story of the hutch's history. When the last sister passed away Kak attended their estate auction and bought the hutch. 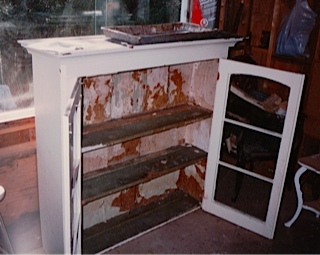 The hutch was in very bad shape, and had many layers of paint with white being the top layer. There were several layers of wallpaper glued to the inside. It was such a mess that Kak asked her grandson (my husband) to refinish it for her. He tore the hutch apart, stripped the paint and wallpaper off, then refinished it and put it back together. Then it went to his grandmother's house in St. Mary's. It was her intention that the hutch be given to my husband on her passing. And so here it sits in our home. As you can see we've started putting a few of our own treasures in it for display. Below is a photo of the hutch when Kak had it in her home. 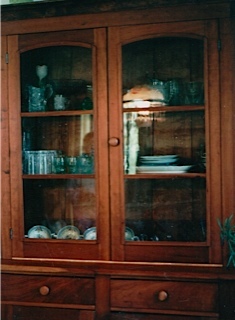 Two other things of interest - see the dishes in the bottom left of the hutch when Kak had it in her kitchen? Those are 4 antique soup bowls, double handled. Kak loved soup and had it every day for lunch. Those were the bowls she ate her soup out of. And when the dishes were removed from the hutch after Kak's passing, it was discovered that those bowls had my name on tape on the bottom. Kak taught me to make soup and she knew I made it all the time. How wonderful that she thought of me, her grandson's wife. I eat my soup from those bowls now too. The last thing that we love about this is the red tray you can see in the photo of the hutch as it stands now in our home. You can't see it very well but it's on the bottom shelf, middle. The tray was one that Kak used when she worked as a waitress at the Royal Edward Hotel in St. Mary's in the late 1930s. The Hotel was owned by Mr. & Mrs. Pinney and because Kak was a young bride with very little money they often gave her items and furniture from their own home. My husband and I have some of those items in our home now but that's a story for another day. 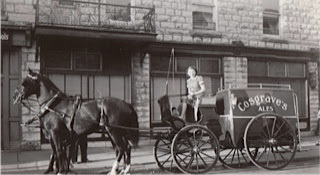 And here is Kak as a young woman working at the Royal Edward Hotel, sitting on the beer delivery wagon. She didn't drive the wagon, she just jumped on to have her picture taken. A few days ago my husband went to help clear out his grandmother's house. She passed away in January this year but the family wanted to wait for nicer weather to tackle such a sad but necessary task. Kak as the family called her, lived in an older yellow brick farmhouse which was full of her beloved antiques. She had family treasures from ancestors on all sides of her family as well as her husband's. She also bought her own antiques and had a good eye for beautiful and unusual pieces. One of the family heirlooms Kak had was this trunk on the left which her father Archie made by hand. It's quite large and has a slightly curved top. It sat in a spare bedroom covered with antique quilts. Kak spent the last 20 years making lists of where each family heirloom or prized antique was to go. She remembered the history of every piece she bought and every item passed down in the families. And she knew what grandchild or great grandchild was to be given the privilege of caring for each heirloom when she was gone. Many of the items had names written on tape attached to the back or the bottom of the piece. Other smaller items were listed and described, with the name of the person who was to have it on her death. This trunk had my husband's name on the bottom on a piece of green tape. It was his great-grandfather's and we know it was built by Archie (aka Achille DeMeulenaere) after he arrived in Canada from Belgium, so after 1900. Kak couldn't remember when her father made it but we are hoping to find out more information from Archie's grand-daughter who we co-incidentally "met" online yesterday! Meantime the trunk sits in our sunroom where it can be enjoyed and treasured for many years to come. I finally managed to watch an episode of Finding Your Roots on PBS last night. It featured Kevin Bacon and Kyra Sedgewick. The host, if you haven't seen this series, is Henry Louis Gates Jr. I thought I'd love this show. Especially this episode. I expected to be glued to the television while it was on. But the truth is it didn't grab me. I was bored. It didn't show any of the research behind the scenes. It didn't walk me, the viewer, through any steps that showed me how they got to Ancestor "A" or "B" or whoever they were focused on. It also seemed to be a celebrity love fest - with a whole lot of buttering up of Kevin and Kyra. Don't get me wrong I like both of them as actors, very much. They seem like great people. But the show is called "Finding Your Roots" and that's what I want to hear about. There was also an awful lot about the host himself. Certainly more than I was interested in. That confused me. I didn't expect to be seeing photos of Professor Gates as a student and hearing his stories about his own life. I'll watch one more episode to be fair. I'll try to be open-minded. But in comparison to Who Do You Think You Are? on NBC it fell short. By a lot. At least for me. I wanted to like it. I tried to find something good about it. But I couldn't. I expect I'm in the minority and in fact I'll probably get a lot of criticism from my readers but I have to call it like I see it. Labels: Finding Your Roots, NBC, PBS, Who Do You Think You Are? Meantime here is Gary's submission, copied and pasted so it is as he wrote it. Since he hasn't used any capital letters in the submission it may be safe to assume that Steven's middle initial is "L" and not "I"
PROVO, Utah & LONDON & TEL AVIV, Israel – April 5, 2012: MyHeritage, the most popular family network on the web, today announced the ability to search billions of historical records, including the 1940 U.S. Census, on-the-go via a new version of the free MyHeritage Mobile App for iPhone, Android and iPad. The new version 1.2 of the MyHeritage App also searches more than 22 million family trees, helping users with their family history research. The move further extends MyHeritage’s leadership by offering an intuitive and exciting experience for families to discover more about the lives of their American relatives in 1940 and to trace their roots around the world, all on-the-go. The MyHeritage Mobile App was first introduced in December 15, 2011 and has since amassed an install base of more than 500,000. In addition to searching historical content, it allows users to take their family tree on-the-go with an attractive display specially suited for mobile devices, capture family moments for future generations and stay in touch with family anytime, anywhere. As millions of people rush to satisfy their curiosity and access the 1940 US census - one of the most significant sets of historical records ever to be released - MyHeritage is currently the only commercial player offering both a complete set of images from all US states and a preliminary searchable index, available via the new MyHeritage App and on www.myheritage.com/1940census. Access is completely free and no registration is required. All 3.8 million images of the 1940 U.S. Census, and the initial collection of indexed records searchable by names, facts and other criteria, are now available to explore for free on the MyHeritage App, downloadable from the App Store or Google Play (formerly Android Market). The app can search the entire MyHeritage data collection of more than four billion records, many exclusive to MyHeritage, including birth, marriage, death, immigration and military records, census records, newspapers, yearbooks and much more. Available in more than 20 languages, the app enables family history lovers all over the world to explore their family’s history.